Players split up into two teams of similar size and skill. You need at least four players (two teams of two) for a standard game. Each team chooses one player to be their spymaster. Both spymasters sit on the same side of the table. The other players sit across from their spymasters. 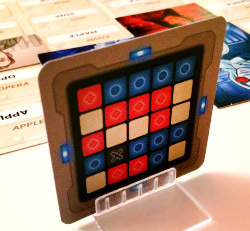 Randomly choose 25 codenames and place them on the table in a 5-by-5 grid. 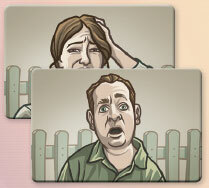 Note: While shuffling the codename cards, be sure to flip over half the deck once in a while. This will mix the words more thoroughly. 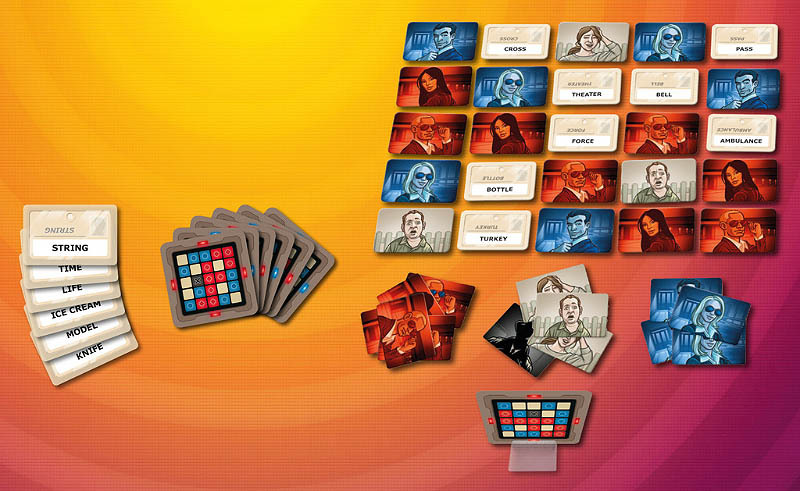 Each game has one key that reveals the secret identities of the cards on the table. The spymasters should choose the key card randomly and slide it into the stand between them. Any side can be up. Don't think about it. Just slide it into the stand. And don't let the field operatives see it. The key corresponds to the grid on the table. Blue squares correspond to words that Blue Team must guess (blue agents). Red squares correspond to words that Red Team must guess (red agents). 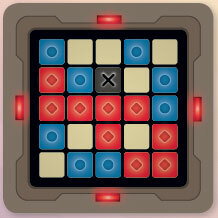 Pale squares are innocent bystanders, and the black square is an assassin who should never be contacted at all. The four lights around the edge of the key card indicate which team starts. The starting team has 9 words to guess. The other team has 8. The starting team will give the first clue of the game. The red agent cards go in a stack in front of the red spymaster. The blue agent cards should be in front of the blue spymaster. This helps everyone remember which team they are on. The double agent belongs to whichever team starts. Flip it to that team's color. It will be one of that team's agent cards for the duration of the game. 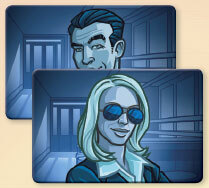 The innocent bystander cards and the assassin should be kept in between, where both spymasters can reach them easily. Teams take turns. The starting team is indicated by the 4 lights on the edges of the key card. If you are the spymaster, you are trying to think of a one-word clue that relates to some of the words your team is trying to guess. When you think you have a good clue, you say it. You also say one number, which tells your teammates how many codenames are related to your clue. Example: Two of your words are NUT and BARK. Both of these grow on trees, so you say tree: 2. You are allowed to give a clue for only one word (cashew: 1 ) but it's fun to try for two or more. Getting four words with one clue is a big accomplishment. Your clue must be only one word. You are not allowed to give extra hints. 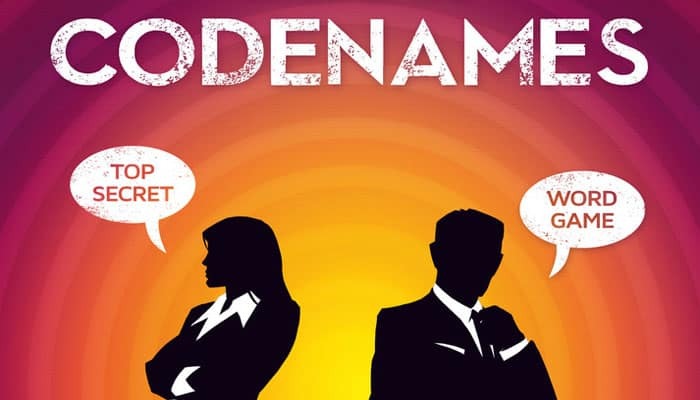 For example, don't say, "This may be a bit of a stretch…" You are playing Codenames. It's always a bit of a stretch. Your clue cannot be any of the codenames visible on the table. 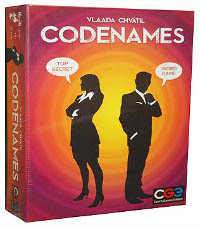 On later turns, some codenames will be covered up, so a clue that is not legal now might be legal later. When the spymaster gives a clue, his or her field operatives try to figure out what it means. They can debate it amongst themselves, but the spymaster must keep a straight face. The operatives indicate their official guess when one of them touches one of the codenames on the table. If the field operative touches a card belonging to his or her team, the spymaster covers the word with an agent card in that color. The team may guess another word. If the field operative touches an innocent bystander, the spymaster covers it with an innocent bystander card. This ends the turn. If the field operative touches a card belonging to the other team, the word is covered by one of the other team's agent cards. This ends the turn. (And it helps the other team). If the field operative touches the assassin, the word is covered by the assassin card. This ends the game! The team that contacted the assassin loses. Tip: Before saying your clue out loud, make sure it doesn't relate to the assassin. The field operatives must always make at least one guess. Any wrong guess ends the turn immediately, but if the field operatives guess a word of their team's color, they can keep guessing. Example: Red Team's first clue was tree: 2. The red operative wanted to guess ORANGE and NUT. She guessed ORANGE first. That was an innocent bystander, so she did not get a chance to guess NUT. Blue Team took a turn and correctly guessed two words. Now it is Red Team's turn again. The red spymaster says river: 3. The red operative is pretty sure the AMAZON is a river, so she touches that card. 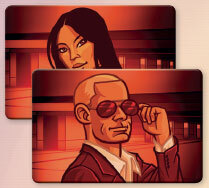 The spymaster covers it with a red agent card, so she gets to go again. A river has a BED, so she touches that codename. It's also red, so she can go again. She's not sure of the third river word. She picks NUT. This has nothing to do with river. She is guessing a word from the previous clue. NUT is a red word. The operative has made 3 correct guesses for the clue river: 3. She is allowed one final guess. She can try to find the third river word, or she can try to find the other tree word. Or she can stop at three and let Blue Team have a turn. You are allowed only one extra guess. In the example above, the red operative would be allowed 4 guesses because her spymaster said the number 3. When the field operatives say they are done guessing (or when they guess wrong) it is the other team's turn. Spymasters take turns giving clues. Each turn covers up at least one word, which makes guessing progressively easier. The game ends when one team has all their words covered. That team wins. It is possible to win on the other team's turn if they guess your last word. The game can end early if a field operative makes contact with the assassin. That operative's team loses. Do other people want a chance to be spymasters? Setup for the second game is easy. 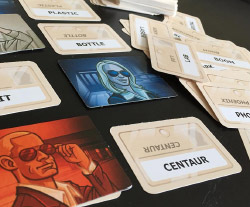 Remove the cards covering the codenames and put them back in their stacks. 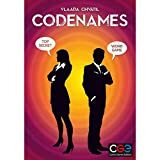 Now just flip over the 25 codenames, and you're ready to go! Sorry. We almost forgot. You see, we don't use the sand timer very often. If a player is thinking too long, any player can flip the sand timer and ask the slow player to make a decision before time runs out. If you are having trouble, you can even use the sand timer on yourself. If you can't find a good clue before time runs out, just give a clue for your hardest word and keep thinking while the other team plays. If you prefer to play with strict time limits, you can download our timer app at codenamesgame.com.